Five adorable animal motifs, including a puppy, piggy, monkey, bear and bunny, are alternately stitched together with lightly textured pastel squares. This sweet baby afghan will be a welcome and treasured gift. 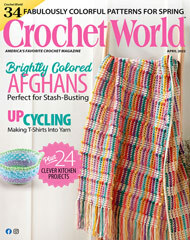 This e-pattern was originally published in Annie's Scrap Crochet Club. Size: About 37" x 37". Made with fine (sport) weight yarn and size F/5/3.75mm hook.